Well before Ajax and Microsoft's Windows Presentation Foundation hit the scene, Macromedia offered the first method for building web pages with the responsiveness and functionality of desktop programs with its Flash-based "Rich Internet Applications". Now, new owner Adobe is taking Flash and its powerful capabilities beyond the Web and making it a full-fledged development environment. Each code recipe presents the Problem, Solution, and Discussion of how you can use it in other ways or personalize it for your own needs, and why it works. You can quickly locate the recipe that most closely matches your situation and get the solution without reading the whole book to understand the underlying code. Solutions progress from short recipes for small problems to more complex scripts for thornier riddles, and the discussions offer a deeper analysis for resolving similar issues in the future, along with possible design choices and ramifications. You'll even learn how to link modular ActionScript pieces together to create rock-solid solutions for Flex 2 and Flash applications. 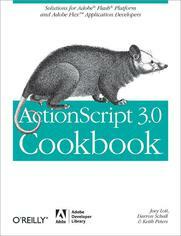 When you're not sure how ActionScript 3.0 works or how to approach a specific programming dilemma, you can simply pick up the book, flip to the relevant recipe(s), and quickly find the solution you're looking for.